Winners must email Sue at sue@suebleiweiss.com with their full name and mailing address by 2/9/12 in order to claim their prize. 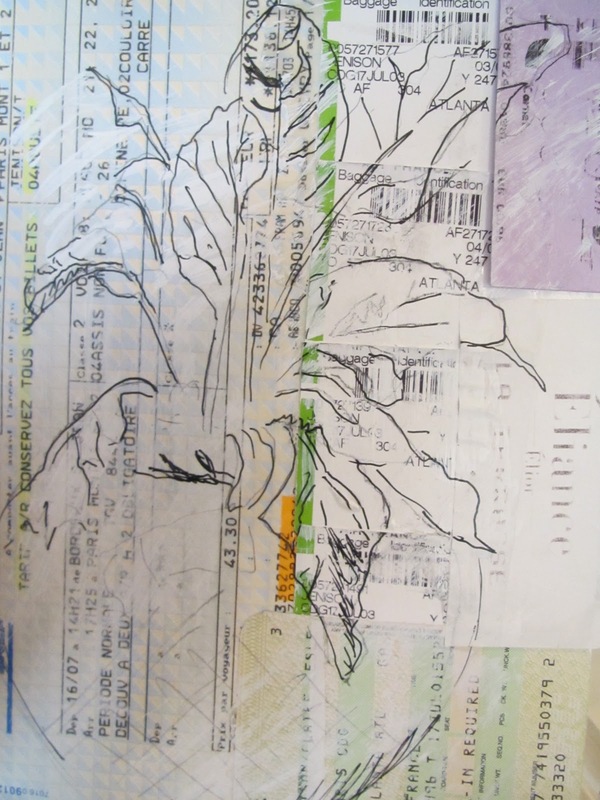 Check out these opportunities to make art with the Sketchbook Challenge artists. 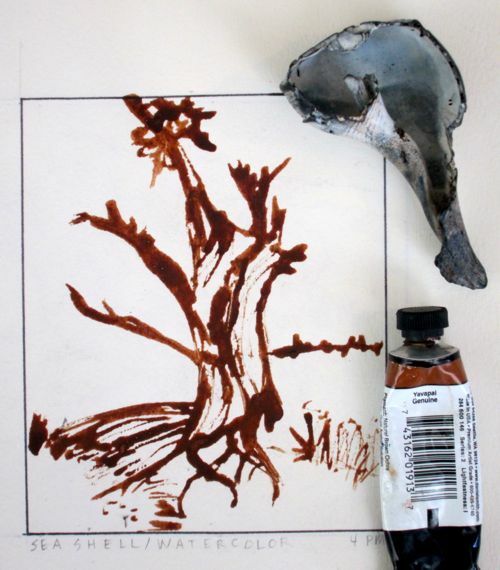 February 15, 2012 Keys to Dynamic Composition (6 online sessions) Learn not only the basics, but the nuances of composition to get more out of your creative expression. More info here. 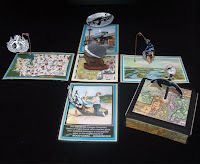 April 4, 2012 Text and Image: Telling Stories in Collage (six online sessions) Did you ever want to express yourself in words and images to make beautifully expressive collage? In this workshop we will explore the power of image-word relationships to discover a world of complex layers of meaning, exciting surprises, and personal expression. More info here. April 4, 2012 The Sketchbook Practice Workshop (six online sessions) In this workshop we are using the as a playground of visual ideas, a place to let your muse take over, and a workhorse for developing drawing, painting, and collage skills. More info here. 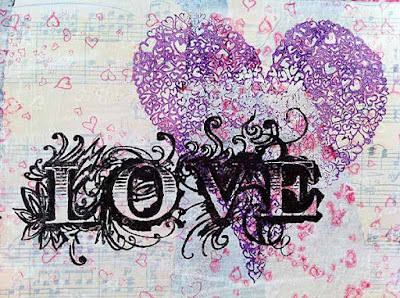 August 10-12 A Passionate Correspondence; lettering, drawing and love! More info here. Now- March 31, 2012 Personal Geographies on display at the Denver Public Library. See all the maps in my book Personal Geographies. More info here. If you have always had the desire to be an artist or simply wish to increase your creativity you need to learn the basic alphabet of the visual language. Have fun on-line as you complete a series of exercises in paper and cloth under Lyric's gentle and encouraging guidance. August 15-18, 2012, Fall River, MA Surface Design Sampler Platter (4 days!) Are you are intrigued by the art of surface design but can’t choose which technique you most want to learn? Spend four glorious days trying a taste each! 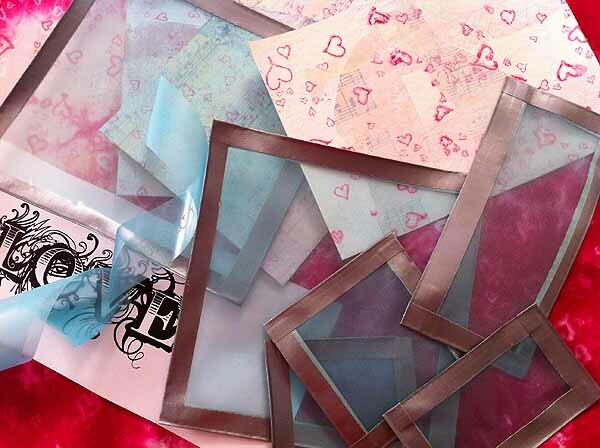 Play with paint, foil, photos and embellishments to create your own gorgeous fabrics. You will delve deeply into printing with screens, stencils, and with stamps you have carved yourself and play with beads to boot! More info here. 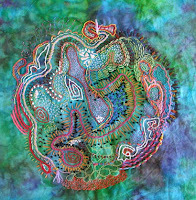 February 7, 2012 Creative Embroidery-Organic Design An online class with six weeks and six lessons. Explore the art of embroidery with thread and mixed media. More info here. 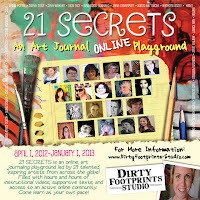 April 1, 2012 21 Secrets is a series of online art journaling classes beginning April 1. On that date, all 21 classes from 21 artists will be available for you. Hosted at Ning, the entire package of classes will be available for you until January 1, 2013. The workshops will each include video and pdf. More info here. 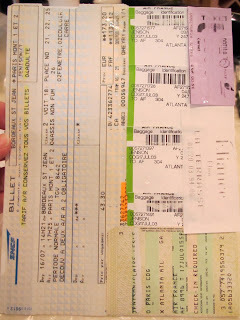 March 30 & April 1, 2012 Rescue Book Journals Are you in the Midwest? 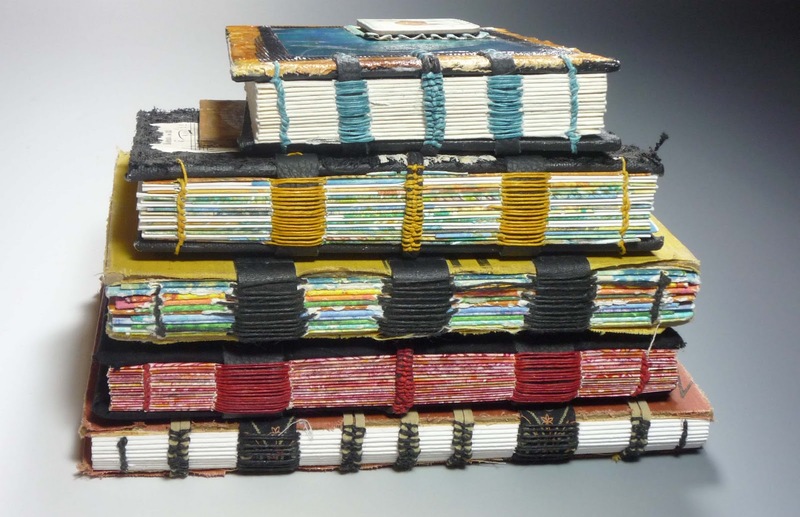 I'll be in Lincoln, Nebraska on March 30 and April 1 to teach Rescue Book Journals and Wild Journal Rumpus. Come and join me for a weekend of journal magic. More to come. June 20-28, 2012 Italy Illuminated. The itinerary is in place and Yay! We will be in Fabriano in time for the Palio - the medieval festival that has been going on since, well, medieval times. Susan Myers, my teaching companion, spent most of her sabbatical year in Fabriano. You are in very good hands! You need to check out my blog for the details of this unique trip. We Final price is still being nailed down, but it looks like approximately $1,500. More info here. February 24 & 25, 2012 Bound By Heart, Made By Hand a two day book making class at "Artistic Artifacts" in Alexandria Virginia. More info here. Two one day classes at "Blue Twig Studio in Colorado Springs Colorado. More info here. 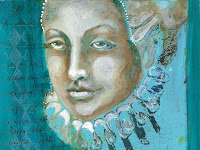 June 7-June 10, 2012 Art Camp For Women in beautiful Winter Park, Colorado. 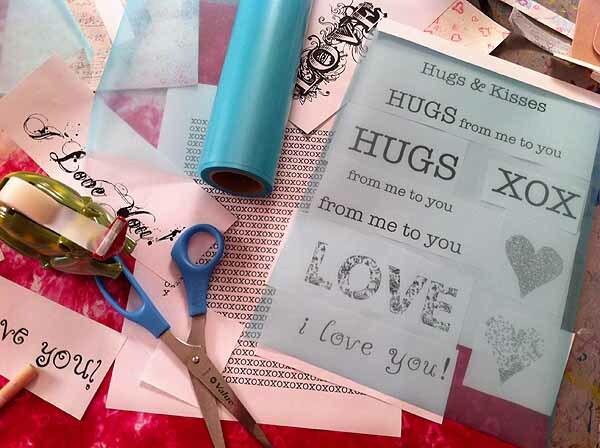 A brand new bookmaking class just for Camp! More info here. 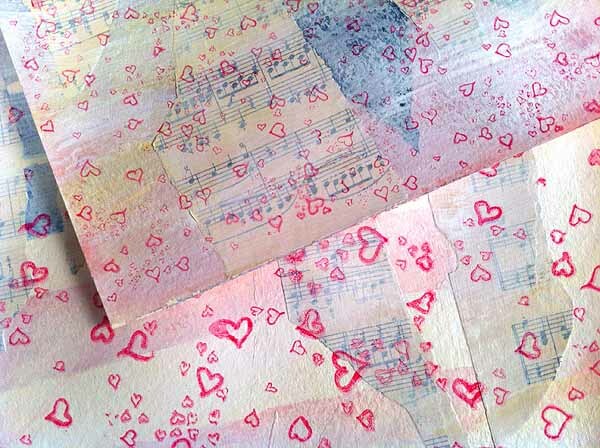 Online class with Jane LaFazio starts February 28 for 6 weeks. 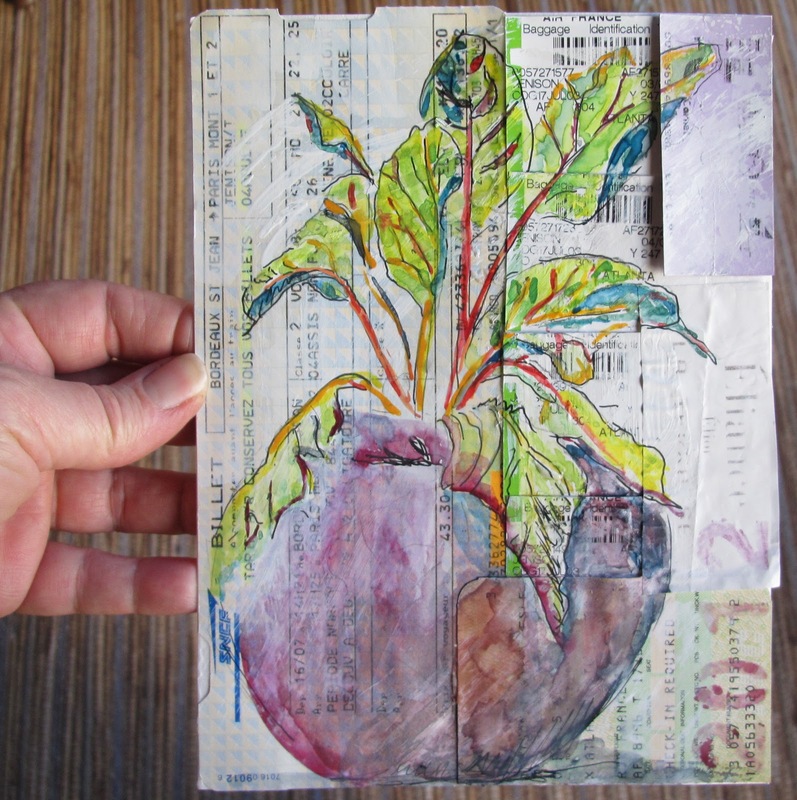 Sketching & Watercolor in a Mixed Media Journal. More info here. 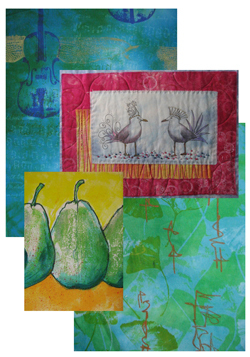 April 19-23, 2012 Expressive Arts Mixed Media Art Retreat in Austin, Texas. Lavender Sage Art Retreats. More info here. 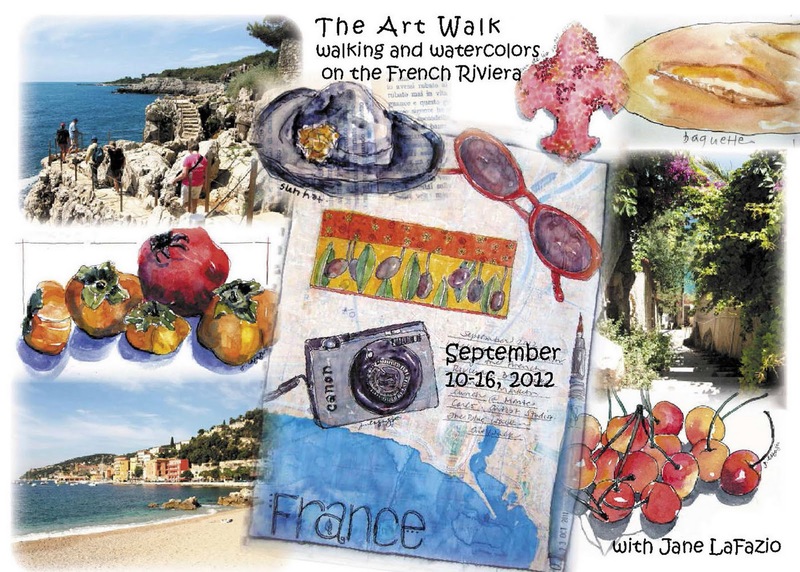 Walking and Watercolor on the French Riviera. More info here. 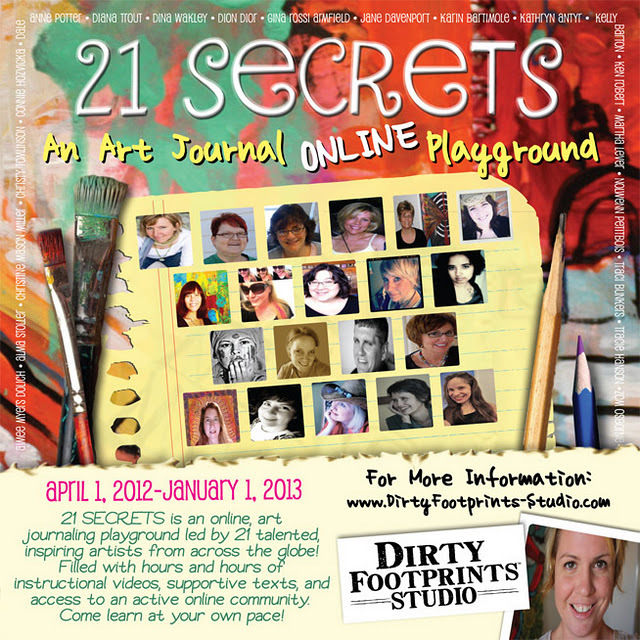 Join me, Alma Stoller and a host of other fabric artists for online video workshops with STITCHED 2012. More than 20 projects and additional ones scheduled, giveaways, forums and support. More info here. 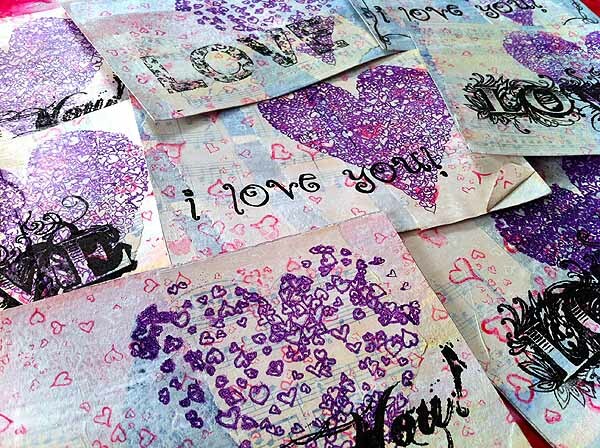 Another year of Art Camp for Women, as featured in the February 2012 issue of "O" magazine from Oprah. We'll be playing with self portraits in a relaxed setting with other women. Everything is included, from gourmet meals to art supplies and lodging with a fantastic view of the mountains. A transformative experience that you'll never forget. More info here. (Lyric here.) Here's some more doodle fun! Let's make a sweet little valentine postcard. 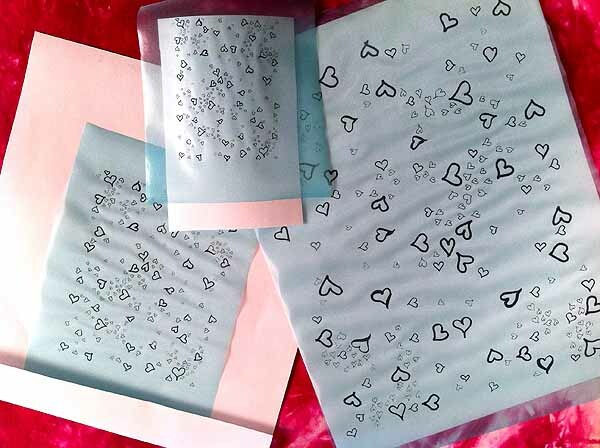 I’d like to show you how my little love affair with my Thermofax screens can be put to good use. I've had these collage backgrounds ready to go for a while. They are old watercolor studies (and I do mean old - like from 20 years ago!) that I've collaged with some worn out sheet music. I stuck them on with gel medium and then painted over them with some watered down acrylic paint. Gesso would have worked just as well. I just wanted to knock back the colors and the strong printing just a bit. 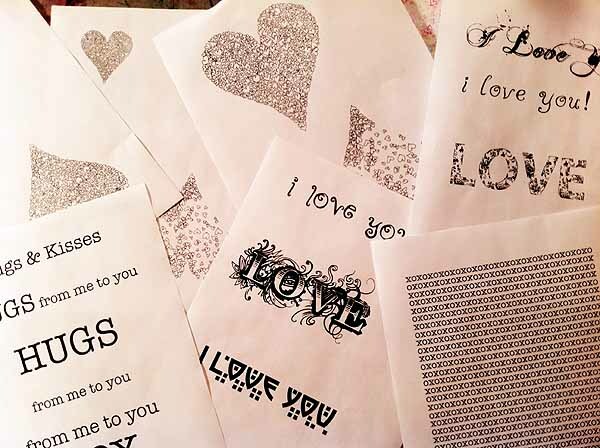 Next I took my favorite black pens and doodled random hearts on paper, scanned it and printed it out in three different sizes. I was thinking of creating an overall background texture with this doodle. Nothing too regular or controlled or overpowering. I send each print of the doodle through my wonderful Thermofax machine along with that green mesh fabric. The heat rollers burn the carbon in the toner through the emulsion coating on the screen. It's almost magic how that happens. It's a little addicting. I usually tape my larger screens to a frame to make them easier to deal with. When I'm printing yardage I like to be able to lift the screen with one had while it still has big glops of paint on it and move it to the next paint location. Smaller screens are simply "bound" with duct tape to keep them from curling. 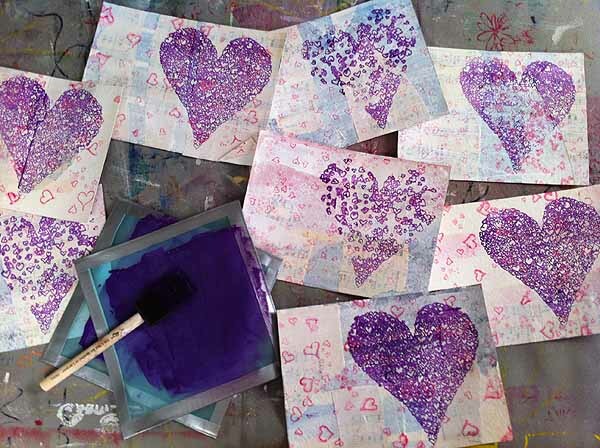 I mixed up some pink acrylic paint - ProChem's ProFab textile paint, since it was within easy reach. I pulled out some cloth to play with while I was at it and printed away. I ended up only using the medium and the large screens for the collage. I got a little lazy and let the screens smudge on some of the prints. No worries. Next comes some focal point imagery. 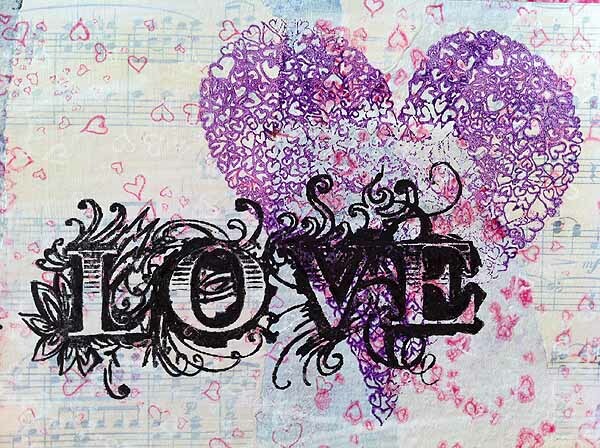 I doodled some more hearts and then got sidetracked for MUCH too long - playing with funky new fonts (dafont.com) and words. I don't always have a plan in mind before I begin a project. Time for some more thermofax screens. I cut out words and arranged them on a piece of paper in order to maximize my screen material. The stuff isn't cheap so I hate to waste it. I made sure to leave enough space around each word or doodle so that I could cut out and tape them. 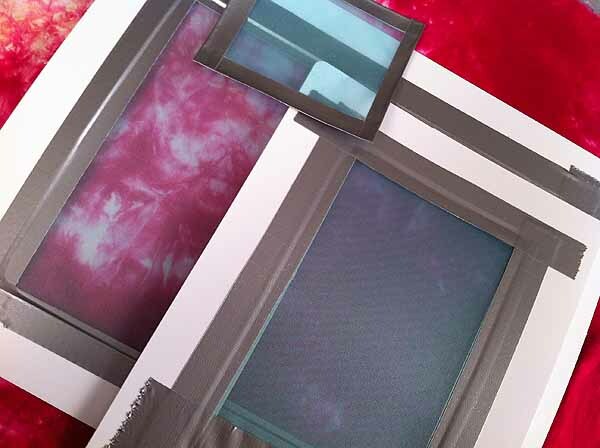 By the way - if you find yourself needing these screens, I've added them to my thermofax shop. This time I chose a medium contrasting color instead of a lighter color. 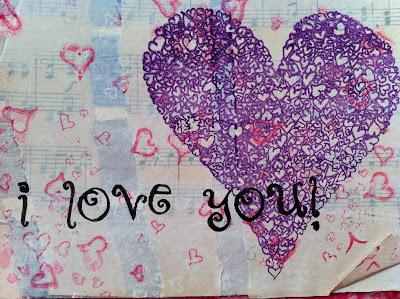 Purple just happens to be one of my favorites so purple hearts it is! When a screen is taped instead of framed. I like to use a foam brush and just mush the paint through the screen like a stencil. 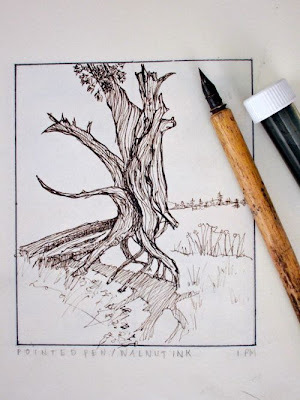 Lynn Krawczyk has some fantastic video tutorials for how to do this - and she sells some pretty awesome screens! Last step? Choose which fun message you want to share with our valentine. These are cut into 5x7 cards. I can write on the back, stick on a stamp and drop them right in the mail. And yes, dear readers, I do. Life is too short not to just say it out loud. If you are in love with any of these screens you can purchase them here. I've even put together a sheet with all the images from the first postcard. and..... one of you lucky Sketchbookers will win that very card. Leslie here. 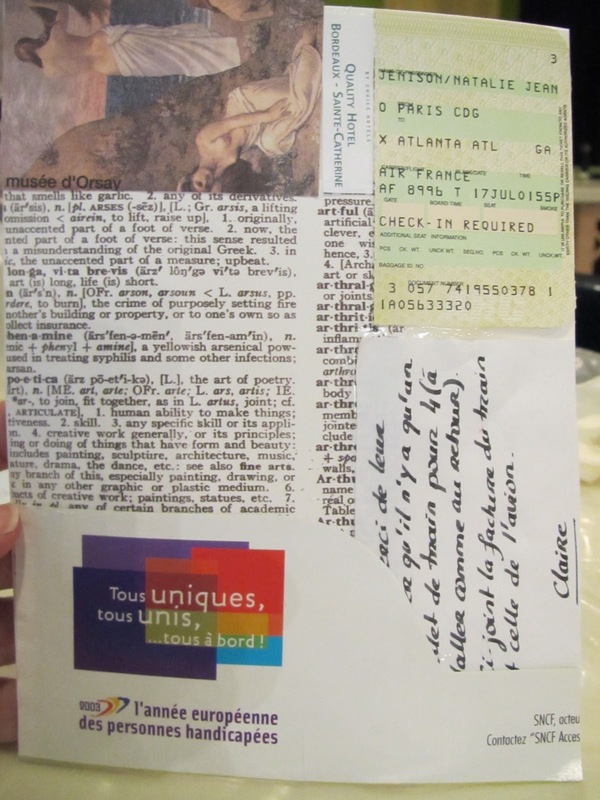 I love cutting and pasting ephemera from local events or travel and using this as a basis for a layered collage. 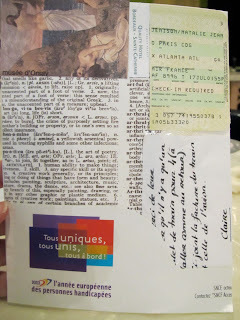 In this case, I'm using some ephemera from a trip taken years ago to France. 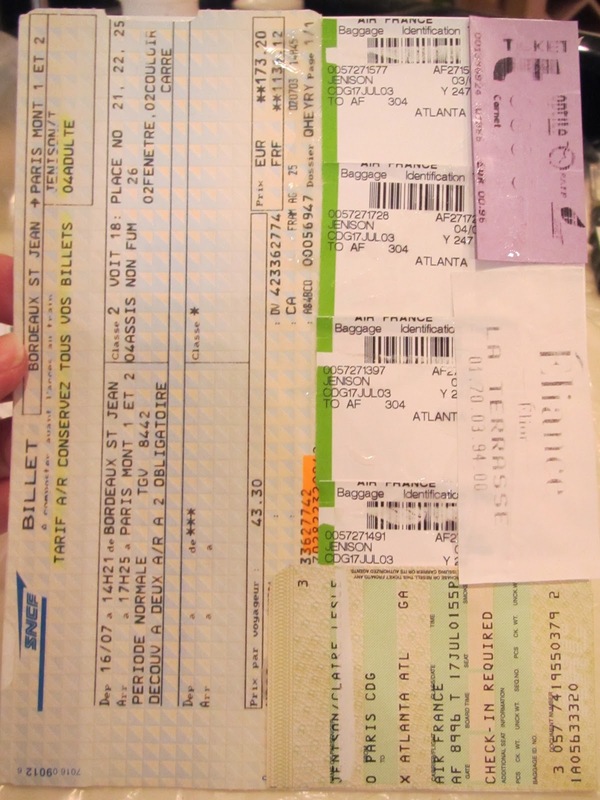 I like to save boarding passes, tickets, and other interesting bits of paper to use for this. It is "non-precious", and therefore perfect for overcoming the fear of the blank page! 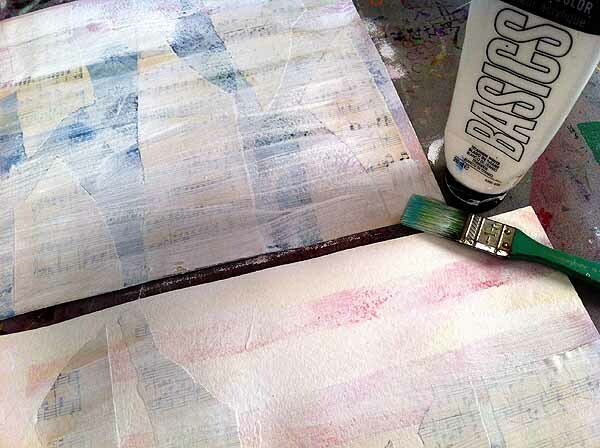 First, I selected several pieces of watercolor paper as a substrate for the collage. Using a palette knife I spread a thin layer of Yes! glue (love that stuff). 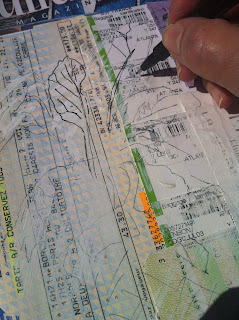 Then I began to layer my paper ephemera. After drying, I quickly striped a bit of opaque white paint over each surface to "mess it up" just a bit. Since it is such a gorgeous day here in south TX (sorry to rub it in!) 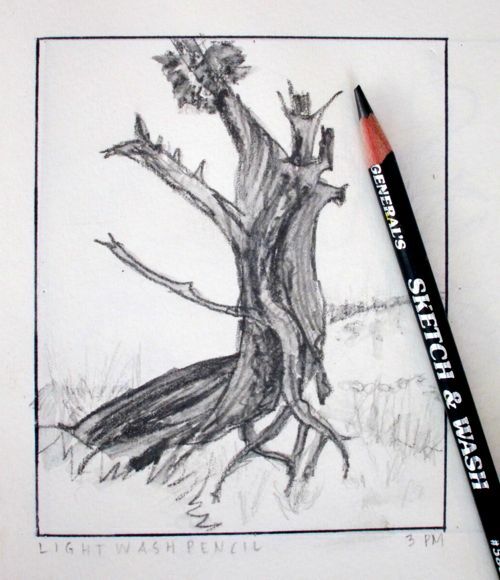 I went outside with one of my pages, my pen and pencil, and my camera. I was looking out the window at my large pots of Swiss Chard and decided it was a perfect moment to go out and enjoy the beauty of the garden and the weather. I really love to see the sunlight through the brightly colored stems. My focus initially is on the bright colored stems of the chard. then I want to establish some of the shadows for reference. This is where having a quick photo is helpful as you build the composition. also stenciling in the year in the lower corner. add light color to some of the reflections. 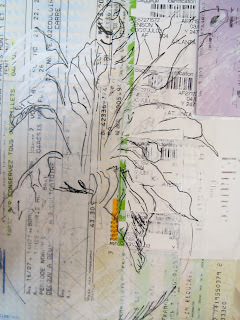 I like the quick, "doodle-sketchiness" of this little piece. 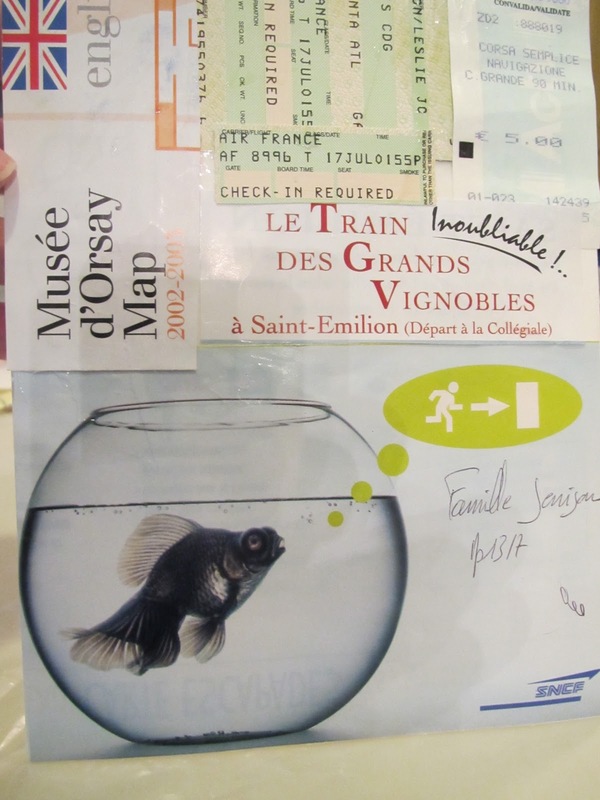 I plan to do the very same thing with the remaining two collaged pages. Stay tuned! Hello all, Jill K. Berry here. Today I want to talk about drawing the same thing, with different mediums. I made four rectangles in my journal, then found a tree stump to draw. I drew the first one with graphite. 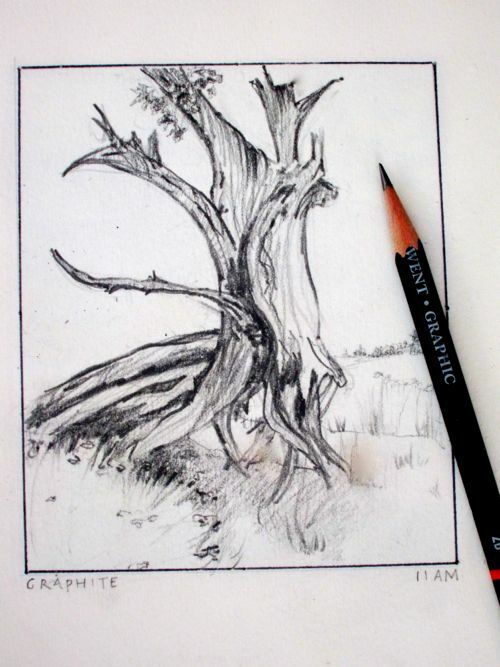 The second one with a pointed pen and walnut ink, a couple of hours later to let the light change. The third one I did a bit later, with a Sketch and Wash Pencil. The fourth one I used a shell and some gouache. 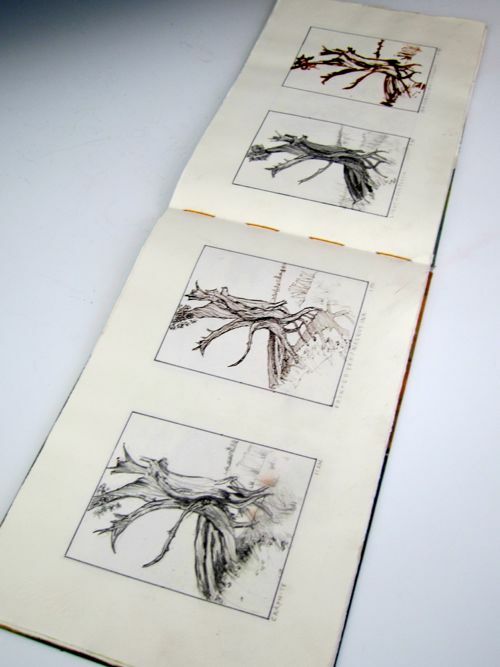 Four tree stumps, four mediums. Get out the stuff you have been meaning to try, and doodle your poodle! Or a tree stump, an apple, your kid, the UPS guy. Draw anything, it feels good. Jamie Fingal checking in. I love to doodle, and it's like second nature to me. I really draw them for nothing in particular (no specific project in mind), except for the fact that it is very relaxing. 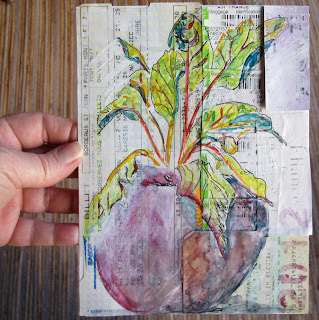 I always have a journal at home and the studio and carry one in my purse. I am never without a pen. It's a great way to inspire myself to do other art, as I may take one of those flowers and use it in one of my art quilts sometime in the near future. This is the kind of art that I create when I am sitting and waiting in an office, on the couch while watching TV, or in an airport. I got a little carried away here, but thought that I would challenge myself with color, since most of my doodles are done with simple a black pen. This was drawn with Sharpies first, then outlined, and detailed. Yes, this was really relaxing and I got lost in just the joy of creating something really fun. It would make great fabric, so I might order some on Spoonflower. And since I drew this with Sharpie pens, it made a nice impression on the back, a softer look. Another fun doodle. So I hope that I have inspired you to just draw and have fun with no restraints. Give it your best shot! Dream, Inspire, Create! 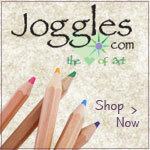 Susan Sorrell-I am always looking for ideas and find these great website that help with doodling skills. I once had a student tell me she couldn't doodle and I needed to teach her how. I just figured everyone doodled....there was no correct way. So, for anyone trying to doodle and can't get the hang of it, here are some helpful sites and suggestions. 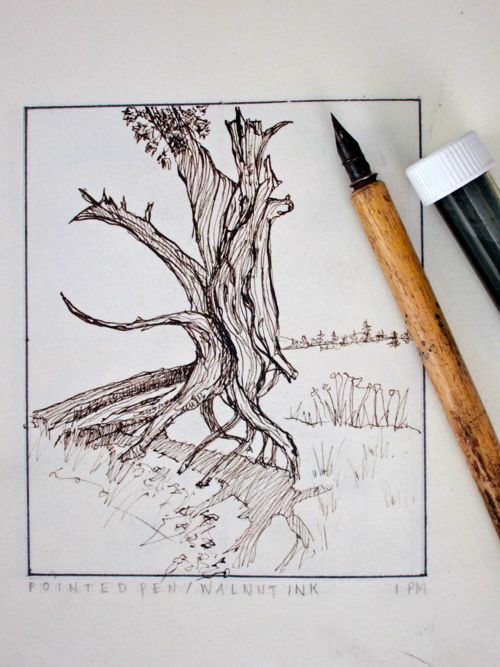 "Zentangle method is a way of creating beautiful images from repetitive patterns. It is fun and relaxing. Almost anyone can use it to create beautiful images. It increases focus and creativity, provides artistic satisfaction along with an increased sense of personal well being." This is a great technique that has prompts. 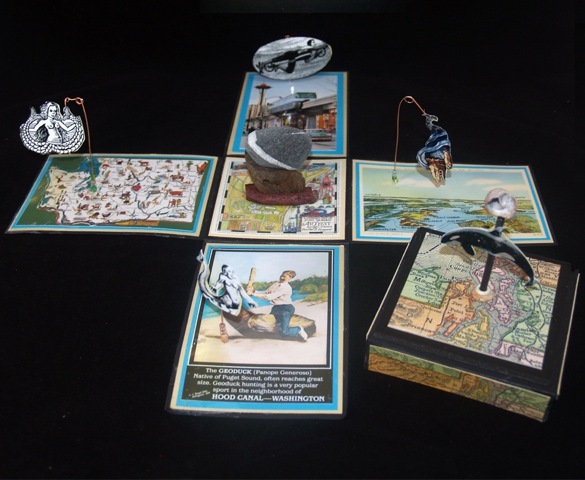 You can buy books with ZenTangle ideas and kits. Plus they have a blog that has some really interesting posts. 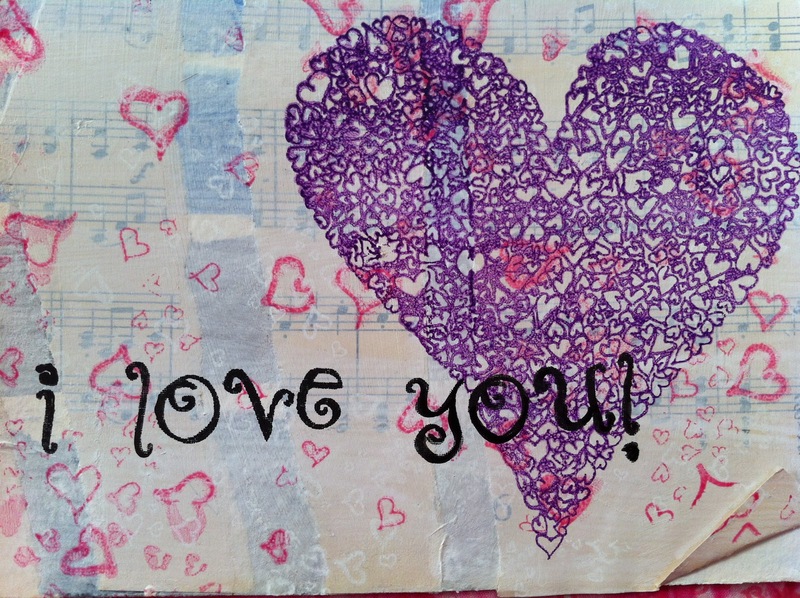 "Doodlers Anonymous was founded to celebrate our addiction, and like any other, we're hooked. The need to draw, sketch, and doodle is constant. 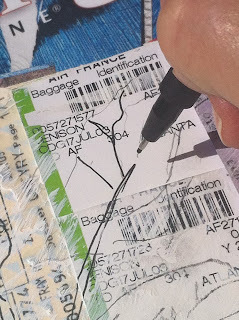 We doodle on almost anything we can find — pencil in a moleskine, marker on a napkin, ink on a torn receipt, sharpie on concrete. And we do it habitually — while on hold, in a meeting, during class, or while we should be sleeping." It is free to join this site and there are some wonderful doodles on here. A treasure trove of ideas. They have featured artists and an email newsletter to keep you up to date on the sites postings. "Print out as many as you want and please share them with others. These pages are perfect for all ages, kids to adult." These are PDF coloring sheets and are free to download and share. Lots of great ideas on this site. If you have some doodle sites you would like to share, please leave a link in the comment section. Remember that National Doodle Day is March 5th!! Is it a Doodle or a Sketch? Welcome to the Sketchbook Challenge 2012!